Well... I think I fixed it, let's hear it for documentation. Just when I had MQTT setup half way I got struck by the idea that there was some group flag for configure. And indeed there is, setting --my-serial-groupname=nodered did the trick making /dev/pts/X owned by group nodered and let Node-RED connect to it, writing and reading works just fine now. Thanks @gohan for your input I think I would have gone the ethernet route in the end if this last test had failed. Renamed the old folder, then copied new files. @inso Did you sudo make install after building it? This command copies the service file and mysgw to their respective locations. @gohan how is the unregistration done? I didn’t know that was needed. We should probably add upgrade instructions to the build page. make install before testing did the trick, now it is 2.3.0 .
thought stop, disable and remove the service would be enough to ensure the service is completely "uninstalled" - could you give me a hint what I´ve missed? I try to access log info from my gateway installed on my domoticz raspberry pi, but I get no success..
First, I can't find the mysensors.conf file : nothing in the /etc folder. I tried to use "find / -name 'mysensors.conf' 2>/dev/null" command, but it finds nothing. I installed the Mysensor gateway on 17th October 2017 and my raspberry pi is working on Wheezy. In Domoticz, I see the Mysensor gateway has version 2.1.1. Any idea of what I should do (except "reinstall whole raspberry pi with latest OS..) ? @ricorico94 there seems to have been some major changes in the raspberry pi gateway, without vorresponding updates to the documentation. I have not been able to locate the exact changes though. @marceloaqno might know. @mfalkvidd : thanks a lot ! I had searched for such version history and couldn't find it. Indeed it seems introduction of the switches for log files was introduced in February, so I should probably update my install. Is there anyfile to remove manually ? or any other command to apply before or after ? Would someone be willing to create a post that lists each step required to set up the simple encryption+signing option? I understand I have to add a password line to the arduino sketch. But how exactly one sets up the server side is still a bit of a mystery to me. It would rock if there was a similar simple command to give during the make process. Thank you for the clarification ! @Anticimex Thanks, but a documentation page (which I have checked before) is not the same as an easy to use guide for beginners. Add the MY_SIMPLE_PASSWORD line to your Arduino sketch. Compile the gateway with --MY_SIMPLE_PASSWORD="yabadabad000!" @alowhum it is not easy to have simple guides tailored for specific usecases when there are so many options. Those tend to not follow implementation and our documentation is made to live with the implementation to ensure it is always up to date. Maintaining a simple guide for every conceivable use case is simply not feasible. The signing and security documentation does have a step by step guide for setting up security. Currently even the outline of the steps eludes me. Seeing the steps for usecase #14 or #385 would already help me understand the scope, and to see what ballpark of difficulty it's in. It's easier to mod a guide when there is something to go on. Secondly, there must be a common use case? The defaults that MySensors uses already suggests a lot of these: a Raspberry Pi with the default settings of the software (ethernet), with the nRF24 radio. @alowhum ok, well first of all, I don't have a rPi setup to test on, secondly I don't have time to look into that (this) environment. But, this is a open source project so anyone is free to contribute with both code and documentation (which in our case lives in the same repositories) so if there are guides missing enyone is welcome to contribute with experiences and guides to help others out. It is just important to understand that the guides need to be maintained in order to remain valid. I don't mind guides at all. But it makes little sense for me to write guides for an environment which I am not familiar with nor can test on. @Anticimex: Sure, that's totally understandable. There are other people on the forum Can anyone help me and @pepson out? And it is exactly my goal to create a more elaborate guide after someone points out the basic steps. Can you write that rigth do you ser to folder ? And I have one question - why is it happened? MysGW work fine about 3 months. what problem did you have? @gohan I was try to find it with ps -ef, but nothing found. Reload RPI. I just gave the right to the folder, and now it's working." But what right hi gave ? Is the rasberry pi serving as a gateway and a server in this project? Or do you have to have a separate pi to host something like openhab and another pi for your gateway? Hi @magjef29, welcome to the MySensors forum! You can run your controller(s) on the same Raspberry Pi. Depending on what tou mean by ”server”, the gateway can be a server, but the gateway is not a controller. If you haven’t already, see the getting started guide for information about the different parts. Hi! Does anybody test Cubieboard as Gateway? I have a cubieboard runing archlinux with spi enabled in kernel. How i define pins for nrf24 gateway connection? Or i need to make big changes in code to star work with different bord than Rpi? Hi @артем-тихонович, welcome to the MySensors forum! I have not heard about anyone using the Cubieboard but hopefully someone else has. The information provided on https://www.mysensors.org/build/orange might be useful if the Cubieboard is similar to the Orange Pie. oh, and in case you haven't already, see the ./configure --help text about the most common NRF24 defines; you might not need the advanced build options. How can i resolve this problem? Please help. GPIO set using this style: SUNXI_GPB(10), this type of gpio defined in #include "gpio_sun4i.h" file. Maybe this specific defining in ARCHLINUX ARM distro. In case someone can help @артем-тихонович, please post the answer in https://forum.mysensors.org/post/95304 so we don’t unnecessarily discuss the same thing in separate threads. I get weird errors when "make"ing. Branch master. Can someone better versed help? EDIT: tested branch development, no problems. @mfalkvidd It sure looks the same. I did a fresh git clone to update my gateway, so shouldn't it be fixed? From what appears on github it looked fixed..
EDIT appears fixed in development branch. But not master? is it possible to conect NRF24 to SPI1 channel on RBpi3? (i mean pins 26, 35, 36,38,40)?? I have not tried it myself, but I beleive https://forum.mysensors.org/post/76079 shows how to do it. Is it possible to redefine pin used for DI00 with rfm69 (with configure option for example) ? Indeed, DI00 is on pin 22 on raspberry, and pin 2 on arduino. But with NRF, pin 2 on arduino is for IRQ, which is connected to pin 15 on raspberry. So if it was possible to force pin 15 for DI00, we could use adaptator card like this one https://www.mysensors.org/hardware/nrf2rfm69. Hi, just build an Ethernet gateway on a raspberry pi B+ following the instructions on this site. And it works! I'm running raspbian stretch lite and used the master branch. No issues. I use the RFM69 radio and this gateway has the HW model. I did have to update al my nodes to use the new RFM69 drivers but that was clearly mentioned in the article. Is this correct, I think there should be a 1 to enable this type of logging. When a new version of mysensors is released, how do I update the gateway version on the raspberry pi? Thanks for the effort you put into this project! Has the issue with RFM automatic transmission control been addressed? @kted Can you give me a pointer to the details of this issue? I'm willing to do some tests and report back my findings. Some info about my configuration, I have 5 nodes at this moment, all battery feeded, they are sending only nodes. They all work but they have a interval of several minutes between sending. The gateway is connected to Domoticz running on another Raspberry PI. @rolo6442u I built an Raspberry gateway using an RFM69 radio, to replace one built around a NodeMCU. All nodes are transmit only, and using the latest stable API. I noticed that all sensors were using max TX power after the first couple of transmissions, although they were respecting the ATC setting before, and were using minimum power most of the time. Now I am concerned about battery life, so I switched back to the NodeMCU gateway, waiting for a fix. I'll put together a temporary net, with a RPi0 gateway and a single node later, to show some real data, if you need any more information. @kted I wil do some tests to check if I see this behavior. Just build a simple test node with a pushbutton, on 2 AA batteries. This node has the low power W radio module. How did you discover/measure that the max TX power was used? @rolo6442u From what the node itself reports from transportGetSignalReport(SR_TX_POWER_PERCENT). It starts from say 50%, and after a coule of transmissions it goes up to 100%, when the nodes are 1m apart. When using a stand alone ESP8266 gateway, it drops to 0%. Not sure if this has a great impact on battery life, depends on how often the node sends a message. Al my nodes have an interval of about 10 minutes. I leave the gateway running for now. Having it running on this PI is a great advantage for me. Will try to do some current measurement on this node and calculate what the impact is on battery life. @gohan Nice. I was thinking to do that same at some time, but I wasn't sure if the Raspberry could handle the load, since I also run domoticz on it, along with pi-hole. How many devices do you have on each gateway? @gohan I meant multiple gateways on the same raspberry. Right now, I have an NRF24L01 gateway, Domoticz, pi-hole, and a VPN server running, with 2 more gateways connected, one local and one remote RFM69 on ESP8266. Yes, I have both radios on the same raspberry. EDIT: ...and here's the fix: "sudo apt-get install g++" (I'm using DietPi now to make it lighter for Pi Zero W). Running Version 2.3.2-beta just cloned today. On a raspberry pi B rev2. A little bug/problem I have discovered with the MQTT gateway. I was playing with the ethernet gateway compile and the -c worked fine. Another thing I have found is I cannot get any logging working with the mqqt gateway compile. It worked fine (named pipe) with the ethernet gateway compile. It seems logging with the mqtt is not instant. It seem to dump the log out of memory periodically, is this expected? Makes it a bit hard to debug real-time. @coza I have experienced that the raspberry pigateway does not flush the logs immediately when logging to file. Syslog logs immediately though. See if switching to syslog helps. I don't want to a gateway with both rfm69 and nrf24.. I'm planning to change my nrf24 sensors with rfm69, to have a better transmission distance. My two nodes are outside, and i have communication trouble if i put them where i wanted, specially for my rain gauge. So I wanted to use those adaptors https://www.openhardware.io/view/16/NRF2RFM69. I received them, and I'm still waiting RFM69 board to test it. But as the pinout is not the same between nrf24 and rfm69 on raspberry gateway, I could not use the adaptor on the gateway. So before making a new board for my raspberry, I wanted to know if it's possible to change the default pin configuration, to have exactly the same as nrf24, and use an adaptor on the gateway too. For that, I "just" need to redefine DIO0 on pin 15 (default is 22). So I wonder if it's possible to do it. And "bonus question", I'd like to know why pin configuration is not the same between arduino and raspberry. Why pin 15 is not used for DIO0 on raspberry (equivalent to pin 2 on arduino). I'm telling myself it should be a good reason, but I don't get it. --my-rfm69-irq-pin=<PIN>    Pin number connected to RFM69 IRQ pin. 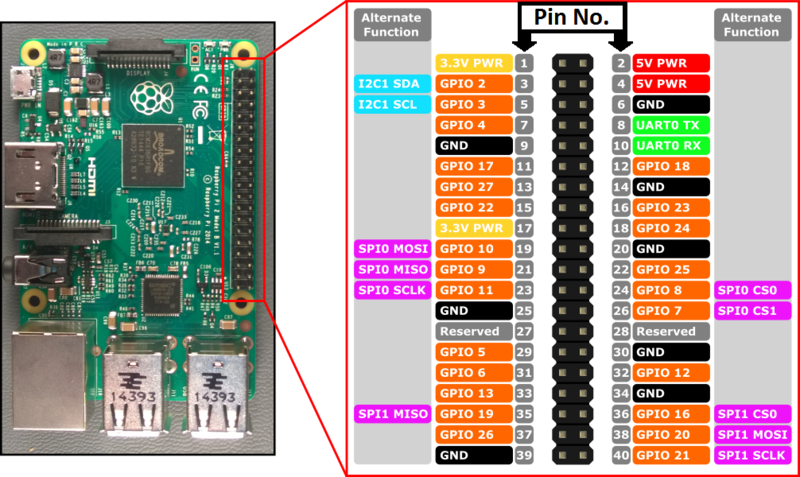 For the bonus question: I wasn't aware that there was a mapping between Raspberry Pi gpio and Arduino pins. Could you share he rest of the list? So, the only mismatch breaking pin compatibility (and preventing to use adaptors on the raspberry pi gateway) is on IRQ/DI00. Adaptors wire RFM69 DI00 on NRF24 IRQ pin, but they don't use, by default, the same pin on raspberry, depending the radio type. which sounds like it could be interrupt. It might be worth a try at least. It's clearly indicated that DIO0 is IRQ. So I think with "--my-rfm69-irq-pin=" it will do the job. I'll test it as soon as i'll receive RFM69. @marceloaqno Sorry to kick this old topic, but I will soon be trying to build my gateway with a Raspberry pi. I was wondering if the capacitor is also required for the gateway, or just for the nodes? Because at the instruction page on how to wire and build a Raspberry Pi gateway, the capacitor isn't mentioned. @rolandow yes the capacitor is needed. I'll add that info to the page. Thanks for noticing. Ok, one more question. I thought I read somewhere that the wiring between the RPI and de radio should be as short as possible, but I can't find exactly where I read that anymore. At another project (zigbee2mqtt) I read that users had better reception when they placed the transceiver further away from the controller, because there was less inteference. So if possible, I would like to use a piece of UTP cable to wire the radio to the raspberry pi. That way I can put the rpi inside a closet, but the radio outside. So I am not sure if longer wires (say 2, 3 meters) is going to be a problem? @rolandow there could be a problem. There are two things to consider. Power drop due to resistance in the cable. See https://electronics.stackexchange.com/questions/113253/voltage-drop-and-safe-current-load-on-cat5-cable for details but use the current used by the radio (provided in the datasheet) instead of the 2.5A used in that question. SPI communication problems due to capacitance in the cable. See https://electronics.stackexchange.com/questions/163468/spi-max-distance for details. See also my post at https://forum.mysensors.org/post/92967 for oscilloscope pictures of what an i2c signal can look like through a long cable. SPI can handle longer cable lengts than i2c though. For me, my electronics is not as good as my development skills ;-). But I gave it a try. According to the datasheet the NRF24 will consume about 14 mA max. My cable is 2 m max, so then the resistance is 0,16ohms. So if I understand correctly the voltage drop would be 0,00224 volt. Sounds neglegtable to me? Also; can't I just measure the voltage at the end of the cable once it's connected to the RPI? At the stackoverflow page somebody says: "In an answer on a Microchip forum, Jan Axelson, author of 'Serial Port Complete', claims a maximum cable length of 10' for the SPI bus. Other posts have mentioned the same figure.". So 10" is about 3 metres, so I am within that range. I do understand though that this isn't a preferred thing to do. Which makes me wonder how other people handle this. I mean; I think ideally you'd want the radio that is connected to the controller in the most 'center' way of the home, right? So do people just hange the Pi and the whole shebang to the ceiling? I'd rather put the controller in the closet where my modem and router are, and then only wire the receiver to outside the closet. Isn't there a better way to do this? You can measure the voltage drop, if you put a load of 14mA on the cable. But without load, there will be no voltage drop. One small adjustment on your calculation: there will be 4m cable (2m to the radio and 2m back). But the drop will still be negligable for a normal nrf24. It is wrong and misleading, as it says that pin36 is SPI1 CS0. In fact SPI1 CS0 by default is pin12. To be able to use pin36 as SPI1 CS0 one have to follow implicit steps which can be found on this forum thread: https://www.raspberrypi.org/forums/viewtopic.php?t=203776. Also it would be useful to add instructions to enable SPI1 in /boot/config.txt to the tutorial.